UPDATE: The Starwood American Express credit card offers in this post are no longer available, but check Hot Deals for the latest offers! Did you know you can save cash on Broadway shows with Starwood points? It’s often a good deal! In addition to award stays at Starwood hotels, flights on ~30 airline partners, Cash & Points, and Nights & Flights – you can use Starwood points to see Broadway shows in 6 cities! 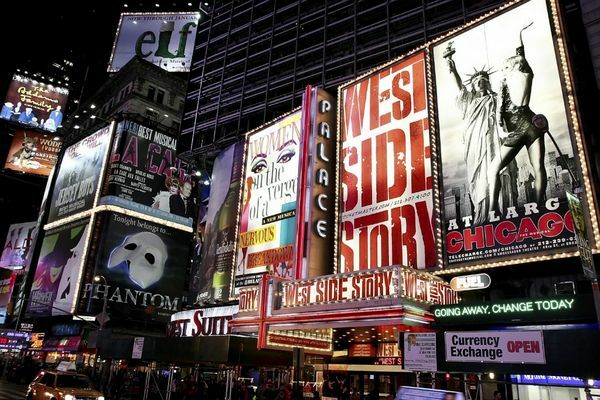 Use Starwood Points to Get Tickets to Dozens of Broadway Shows in Cities Including Chicago, Los Angeles, and New York! I’ll explain how this unique way to use Starwood points works! Starwood hotels include Aloft, Element, Four Points, Le Meridien, Sheraton, St Regis, The Luxury Collection, Westin and W brand hotels. The sign-up bonus on the AMEX Starwood card (personal and small business) is usually 25,000 Starwood points after meeting minimum spending requirements. Check out my top picks for Starwood award stays here in the US (including The St. Regis New York), top US beaches, the Caribbean and Mexico, Europe, Central and South America, and Asia and Australia! I’ve written about how to redeem Starwood points for award stays. 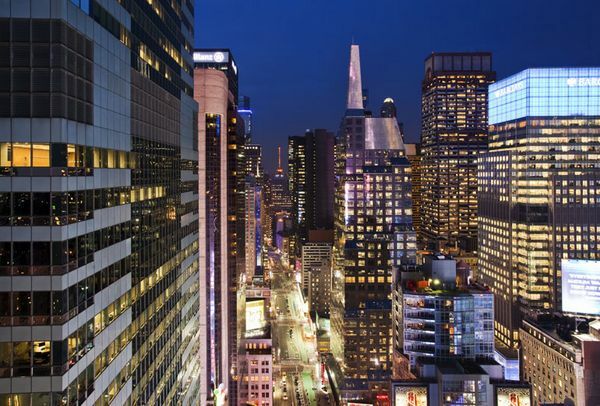 Stay on Broadway at the W New York – Times Square and See a Broadway Show. You Can Redeem Starwood Points for Both! If you enjoy live theater, consider using Starwood points to see Broadway shows with Audience Rewards. You could even see a show AND stay at a Starwood hotel, like the W New York – Times Square, for a truly memorable vacation! Through SPG’s exclusive partnership with Audience Rewards – the official loyalty program of Broadway – you can earn, redeem or use a combination of Cash & Starpoints for tickets to dozens of Broadway shows. This can be a great way to save money when you’re visiting a big city for vacation with the family, or away on a romantic trip. And folks who love Broadway might be tempted to see 1 more show during their travels! Be sure to read my tips about how to get Big Travel with Small Money in New York! Get started by browsing the selection of available tickets. I picked “Les Miserables.” Tickets in the orchestra and front mezzanine are going for $106 each in September. Click “Awards for this Show” to see how many Starwood points it costs for a ticket. 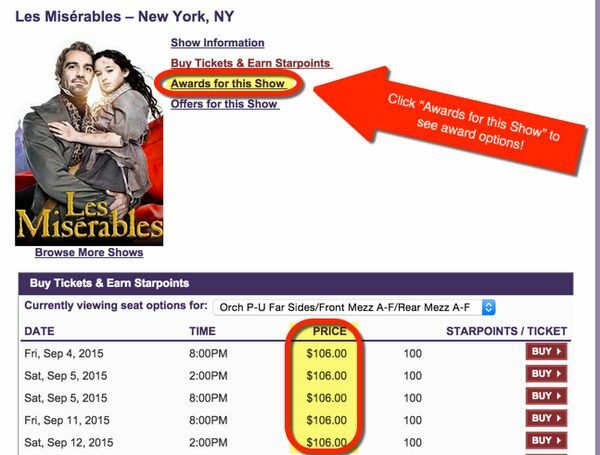 An orchestra side seat for “Les Miserables” costs only 3,000 Starwood points. So each point is worth ~3.5 cents, which is a great deal. That’s because most award redemptions tend to be around 2 cents per point. Anything more is a great way to use your points! Or you can pay a combination of Starwood points and cash. For example, when you pay 1,000 Starwood points for the same ticket, your cash co-pay is only $20. That means the 1,000 Starwood points covers the remaining balance, which is $86 ($106 – $20 cash co-pay). In that case, your Starwood points are worth nearly 9 cents each! When you find a ticket you want, sign-in to Audience Rewards to link up your Starwood account. After you check-out, your ticket will arrive via email. But not every play has these great values for your Starwood points. Some shows cost 10,000+ Starwood points for tickets you can buy out-of-pocket for ~$150. In that case, your points are worth ~1.5 cents each. You’ll save more money when each point is worth at least 2 cents, so you can do better with other shows, or other Starwood awards, like Cash & Points or Nights & Flights. If you love Broadway shows and want to save cash, you can get a great deal with Starwood points! There are other ways to get tickets to shows on Broadway, like StubHub.com or visiting a TKTS booth (in New York). Like with the Starwood points option, you can get a good deal – or a not-so-good deal. Factors like price, convenience, and types of seats available are all considerations, especially for folks who want a certain experience, like being near the stage or enjoying a particular vantage point. And they can vary from day to day, or by performance. As always, run the numbers and choose what’s best for you! Don’t Live Near New York (or Another Audience Rewards City)? Get There for Cheap! You can use your miles or points to get to New York (or Charlotte, Chicago, Durham, Los Angeles, and San Jose) for close to free! United Airlines – There are lots of ways to earn United Airlines miles. Including transferring Chase Ultimate Rewards points to United Airlines. If you need help with booking a United Airlines award flight, check out my post on how to use United Airlines miles. British Airways – If you’re a short flight away from New York (or the other cities on the list), you can save miles by using British Airways Avios points to book an award flight on American Airlines. Chase Ultimate Rewards points , American Express Membership Rewards points, and Starwood Preferred Guest points transfer to British Airways. Amtrak – You can transfer Chase Ultimate Rewards points to Amtrak and travel from cities like Boston and Washington, DC. Here’s how to book Amtrak with points. 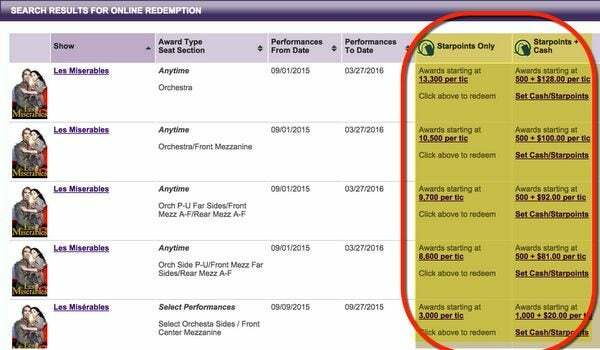 Don’t forget, you can get to the other cities with Audience Rewards options using the ways listed above! Folks love Starwood points because there are several ways to redeem them, including for Big Broadway Travel experiences when you don’t want to pay cash. Starwood partners with Audience Rewards, which means you can use Starwood points, or a combination of Starwood points and cash, to see dozens of Broadway shows in cities including Chicago, Los Angeles, and New York. Your points can save you more cash than an award stay or flight (depending on the show you choose) when you redeem Starwood points this way, which is perfect for a family vacation or spontaneous getaway. Don’t forget you can also use Starwood points for award stays at Starwood hotels and flights on ~30 airline partners! Would you use Starwood points to see a show on Broadway? I think you can only redeem points in ny & charlotte. @Noah – That’s terrific! Glad to hear you were able to see Wicked using Starwood points! How was the show? 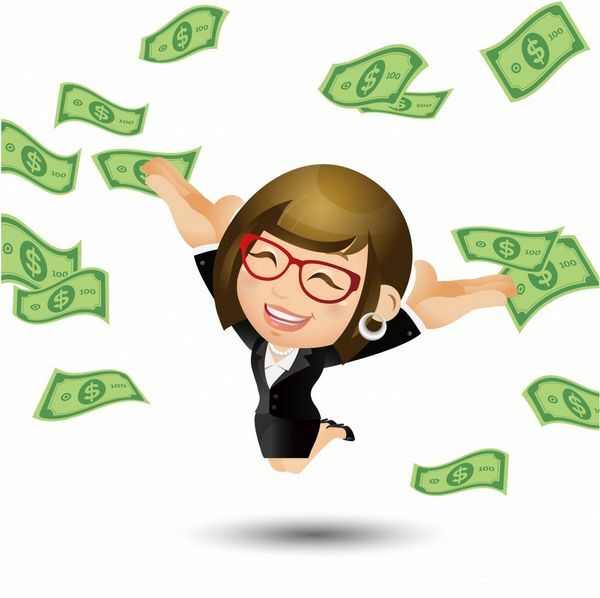 @Gary H – Cash & Points is perhaps my favorite way to use Starwood points. Sounds like an amazing trip! After hiking the Inka Trail in Peru last April, I used 27,000 SPG points for our family of four — using SPG’s Cash and Points — to stay two nights at the Tambo del Inka in Valle Sagrado, Peru. It’s a Luxury Collection Resort & Spa eligible for Starwood stays, and it was absolutely perfect to recover from an arduous four day trek! 40,000 points for 5 nights (5th night free) at the Sheraton Mountain Vista in Avon, CO just booked for skiing this January at Beaver Creek. This 1 br suite with a Small Kitchen is an unbeatable deal for ski season! Westin Hilton Head Resort–36000 for a fantastic 3 day get away!!! !